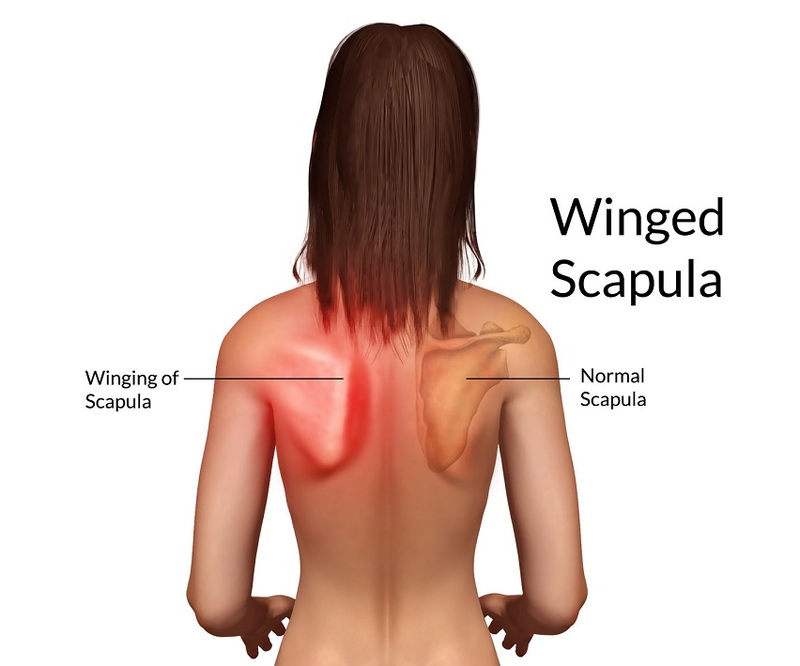 You have a winged scapula when your shoulder blade protrudes from your upper back in an abnormal position. The condition can make your shoulders to round forward to an extent that you cannot pull your shoulder blades together. You may even find it hard to lift and carry objects – it also affects your ability to rotate your body. Thankfully, there are exercises that gradually improve your condition and prevent further complications. Let's find out which exercises you can do. Your physical therapist is likely to start with corrective exercise training to help correct the problem. The method involves identifying the underlying cause of your condition. Your therapist does it by observing how your body aligns in a standing position and how it moves in fundamental patterns such as turning, squatting, and lunging. Often, the underlying cause of your condition is not your scapula, but it could be a misaligned pelvis or lower spine. Corrective exercise helps identify these problem areas and correct them to improve your condition. As one of the best winged scapula exercises, the idea is to relax your spine and allow gravity to pull your shoulder blades down together. Kneel on the floor in a way that your shoulders are directly over your hands and your hip joint over the knees. Let your belly distend toward the ground and slowly extend your lower back while keeping your arms straight. Let your head drop down with your shoulders in a relaxed position. Exhale and bring your shoulder blades together while extending your lower spine slightly. Be in this position for 5-10 breaths and relax. Repeat thrice. The main goal of this exercise is to open up your chest a bit and keep it from pulling your shoulders forward. Start by standing in a doorway while keeping your one foot in front of the other. Ensure that your feet are pointing forward all the time. Place your forearms on the doorway while making sure that your arms are making a 90-degree angle. Slowly shift your weight forward, toward your front foot and let your shoulder blades pull together. Maintain the stretch for 5 breaths and then repeat the same with your legs switched. Looking for the winged scapula exercises to improve your condition? 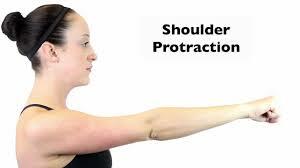 Try scapula protraction for help. Get an exercise band and hold one of its ends at shoulder height. While keeping your elbow bent, push your hand forward until you manage to straighten your elbow. Be sure to apply the force through your shoulder. If you cannot straighten your elbow fully, just reach as far forward as you can. Return to the starting position after a few seconds. This helps improve the mobility of your shoulders and keep your scapula in a normal position. Get a medicine ball, grab it in both hands, and lie down on the floor. Keep your elbows straight all the time. Slowly, push the ball up with the help of your shoulders. Ensure that only your shoulder girdle moves with the ball. Slowly, bring your shoulders back down and repeat. It is one of the very best winged scapula exercises because it not only brings your shoulder blades back in their normal position but it also helps build muscle. You have to do it right to ensure that it strengthens your shoulder's core muscles. You will also notice an improvement in your posture because the exercise strengthens muscles in your back that keep you upright while sitting and standing. 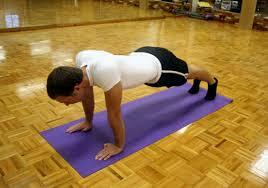 Get into a plank position while keeping your arms under your shoulders and your toes in contact with the ground. Keep your body straight and your neck in a neutral position with your head in line with your torso. Ensure you do not arch your neck and keep your core muscles tight all the time. What sets it apart from traditional pushups is that you do not have to bend your arms, but you need to lower your torso by squeezing your shoulder blades together. 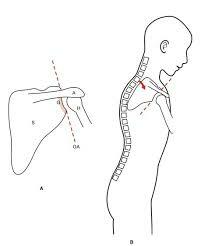 Return to your starting position once you have brought the scapula together. Maintain a flat back and repeat several times. The goal of this exercise is to target your lower trapezius muscle to improve your shoulder motion. Your lower traps can become weaker when you fail to target them while training. The exercise can help strengthen the area along with improving your thoracic mobility. Grab the ends of an exercise band with both hands and take your arms over your head. Keep your elbows straight and pull your arms gentle down to your sides. Take the band behind your neck by gliding your shoulders back. Raise your arms behind your neck to stretch the band. Rotating your shoulders externally is essential for healthy shoulders. This also helps keep your scapula in a correct position. 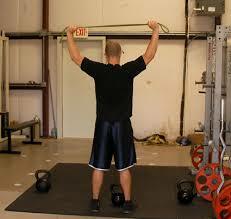 By performing this exercise regularly, you will be able to handle overhead arm actions with better stability. Get in an upright position with your right upper arm extended at the shoulder level. Keep your elbow bent at 90 degrees and then slowly rotate your shoulder internally. Make sure that your forearm points toward the floor. 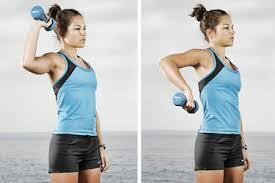 Now, grab a small dumbbell in your hand and rotate your shoulder externally. You should be rotating it at 180 degrees, but do not go beyond the point where your forearm points towards the ceiling. Working Out Before Bed: Good or Bad?